Companies increasingly depend on chief financial officers to take on responsibilities outside of their traditional comfort zones, and the results have been rewarding, some of the region’s leading CFOs said. For example, the CFO doesn’t have to be an expert in coding and software design, but the executive needs to know how to have a meaningful conversation with executives in the IT department – as well as other areas. That’s all in a day’s work for the C-Suite member tasked with driving innovation, creating growth opportunities and mitigating increasing risks to protect the company’s bottom line. Ten CFOs from South Florida companies addressed these issues during a CFO Roundtable held May 4 at Randstad Professionals in Fort Lauderdale. Moderated by Editor-in-Chief Mel Meléndez, it is part of the Business Journal’s ongoing Roundtable Series, where CEOs, CFOs and HR directors shed light on salient topics of interest to our readers. The roundtable was sponsored by Randstad Professionals and MBAF. Money touches just about every part of a business or organization. And whether a company is for-profit or not, strategies have to make financial sense and risks that could cripple the organization must be mitigated. People in operations might be so focused on delivering services that they overlook certain efficiencies. That’s where the CFO comes in. Building solid relationships across departments, especially IT, is key, as big data has changed the way he interacts with people, said Steve L. Pattison, CFO and VP of Miami-based Restaurant Services Inc., the exclusive supply chain manager for Burger King in the U.S. and several international markets. It’s his job to deliver fresh food and toys to the restaurants in a timely, financially efficient manner in an industry where $1 goes a long way. That data helps Restaurant Services forecast demand when placing orders, which is crucial when dealing with food that has a short shelf life because spoiled inventory means lost money. The CFO must make sure the pace of sales and purchase orders are aligned. Another top priority for CFOs is compliance with regulations. Laurie Levine, VP of business and finance for Lynn University, said when an organization relies on federal dollars, it better follow the rules – or it could face serious financial trouble. With her encouragement, the Boca Raton-based school, which has about 3,000 students, hired a full-time chief compliance officer. She also works hand-in-hand with the university’s chief information officer, such as when they’re evaluating apps and programs they might use. Biana Murnane, executive VP and CFO at Sunrise-based BrightStar Credit Union, said she works with the IT team so they better understand how the systems they design impact customers. “I love our technology folks, but [sometimes] we seem to speak a different language,” Murnane said. Learning new skills is a definite plus for CFOs, The Learning Experience CFO Sandy Levine said. She’s become well-versed in construction as the Deerfield Beach-based owner and franchisor of day care centers has grown to 211 locations and is about to expand to the U.K. With about 40 locations opening every year, she must keep close tabs on the timelines of each project and make sure they are performing as expected. Edward Maszak, senior VP and CFO of Sunrise-based Community Care Plan, reiterated the importance of learning as much as possible about a company’s products or services. For him, this means learning the ins and outs of what it takes to provide quality health care services. The companyprovides health plans through Medicaid, Children’s Medical Services Network and self-insured companies. A key element of his business is providing quality outcomes with limited, and often declining, financial resources, Maszak said. So he must be familiar with the best methods of disease prevention, what drugs can be cost-effective, and how to encourage health care members to participate in wellness activities. While CFOs are still thought of as bean counters by some, their knowledge base goes beyond finances, said Alex Zaldivar, CFO of Fort Lauderdale-based cybersecurity firm Cybraics. Customer preferences change faster than the cloud cover in South Florida, so CFOs must make sure their companies quickly adapt to avoid getting soaked. Forward thinking is crucial, even as immediate demands can make it challenging to step back from the daily grind and think long term. But this is critical for any CFO to master, if their company is to succeed. For the fast-food industry, the last major innovation was the advent of the drive-thru, but there’s a big shift occurring, said Steve L. Pattison, CFO and VP of Miami-based Restaurant Services Inc. With the advent of digital menus and third-party deliveries, some restaurants have decided to scrap expensive retail locations and operate out of warehouses with a focus on deliveries, he added. The trend isn’t unique to restaurants. Few banking customers want to enter a branch as they shift to mobile banking, said Biana Murnane, executive VP and CFO at Sunrise-based BrightStar Credit Union. Her company has focused more on digital banking, and she anticipates mobile-to-mobile payments will become more frequent. As some physical locations go, companies must train their employees to help them “upskill,” so they’re prepared for the new job requirements, said Lisa Wulf, executive VP and CFO of the Florida/Caribbean region for Right Management, a career and talent management firm that’s a subsidiary of ManpowerGroup (NYSE: MAN). Still, finding a way to hire strong employees to grow a company during a period of low unemployment can be challenging. Some companies find that the best way to expand quickly is to enter the mergers-and-acquisitions market. Commercial real estate brokerage Avison Young opened its first Florida office in Fort Lauderdale in 2012, and wanted to make a big splash in a market with many well-established names. It acquired four Florida brokerages in three years, which helped introduce it to new parts of the state, said Brian Mark, principal and financial manager for Avison Young. The biggest risks and threats for companies also evolve over time. For example, malware and data breaches are issues that companies routinely deal with today that were barely on CFOs’ radar a decade ago. Some companies now engage in the digital-age version of fire drills. Edward Maszak, senior VP and CFO of Sunrise-based Community Care Plan, said its IT department sends out fake phishing emails to train employees on those risks. Avison Young has a property management servicing line that runs about 200 bank accounts, so even top executives sometimes get emails where someone “posing” as the CEO is instructing them to wire $100,000, Mark said. “It helps educate our employees, but we also created a system where there is a [required] phone call confirmation,” he added. The CEO-CFO relationship is a delicate one. A CFO can be the CEO’s best friend at a company, as well as a trusted adviser. The key is balancing that relationship so the CEO views the CFO as a valuable partner who looks beyond the numbers. The executives must complement each other, with the CEO laying out the vision and the CFO executing that vision across multiple departments, said Max Farahani, CFO of Plantation-based Coastal Wealth. He recommends the book “Rocket Fuel,” by Gino Wickman and Mark C. Winters, as a helpful resource for executives looking for a balance between vision and integration. Steve L. Pattison, CFO and VP of Miami-based Restaurant Services Inc., said he continually strives to understand the role of his CEO – to the point that he sometimes finds himself finishing the CEO’s sentences. A CEO should think of the finance executive as someone who solves problems, not as the person that says “no” to costly ideas, Pattison said. “At the end of the day, I will do what he decides to do, but he will welcome my input,” he said. As with all relationships, communication is key. Lynn University VP of Business and Finance Laurie Levine said the Boca Raton-based university’s president is great at seeing the big picture and the long-term view. While she’s internally focused, he’s externally focused and comes up with innovative ideas. 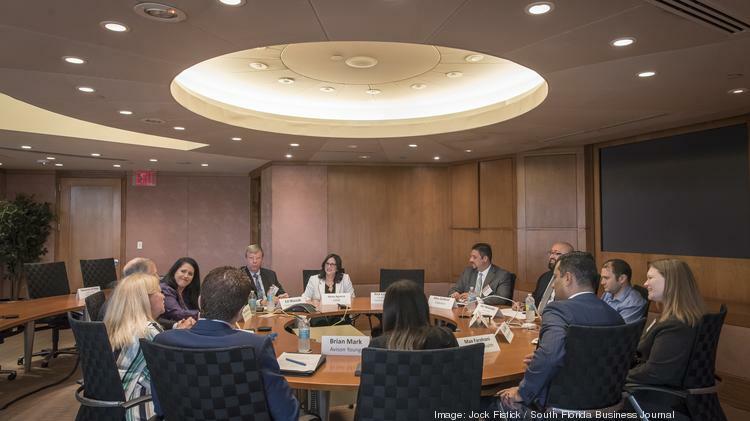 It’s crucial that the CFO communicates the vision of the CEO to employees, customers and investors, said Hena M. Aguirre, CFO of Coral Gables-based EWM Realty International. She spends more time writing and working to spread the company’s message than drafting financial statements. Of course, that means the CFO needs plenty of face time with the CEO so they’re on the same page when it comes to the corporate message. “It should be a collaborative and respectful relationship where your ideas are respected,” Aguirre said. What’s the biggest misconception about CFOs? “We aren’t viewed sometimes as problem solvers, but maybe a blocker. If we are doing our job, we can fix things and help solve problems.” – Steve L. Pattison, Restaurant Services Inc.
What aspect of your job is the most stressful? Is being part of the C-Suite what you expected it to be?